Document of a session for The Great Sea Snake, an album track for Ben Nicholls’ Kings of the South Seas recording and live music project. 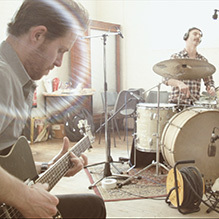 The album Kings of the South Seas, produced by John Parish, was recorded at Cecil Sharp House in June 2014 with Ben on vocals and guitar, Richard Warren on guitar and Evan Jenkins on percussion. The project consists of songs from the Georgian and early Victorian periods associated with whaling voyages and other expeditions to the South Pacific. They tell stories of carnage, boredom, religious fervour and exaggerated stereotypes, presented for contemporary audiences. There is more information about the project in a short video I made: click here.